This roulade, which by the way is just another word for a roll, is devilishly good. There are countless variations of chicken roulades, in fact. They can be stuffed with basically anything you can imagine. Well, not anything maybe (chocolate chicken roulade might be a little too funky, I guess), but still there are many ingredients that just work perfectly in that lovely rolled up wonder. Spinach, bacon, cheese, sun-dried tomatoes, shallots – these are just some of the ideas, and the list goes on. What I love about chicken roulades is how cute they look. This is one of those dinners that will elicit a lot of oohs and wows. They really are easy to make! 2. Place the chicken breast into a Ziploc bag (or between two sheets of plastic wrap). 3. Beat the chicken breast with a meat mallet until about 1/8 inch (3 mm) thin. This is the ham I had on hand. 4. Place two slices of ham lengthwise along middle of the breast. 5. Then place two thin slices of the cheese over the ham. I use Edam cheese in this recipe. You can, of course, use any kind you like. 6. Now divide the blue cheese into three equal parts and arrange one third crosswise at the near end of the breast. We are starting to create the center of our roulade here. I had some pickled ones in my fridge. 7. If you are using fresh red pepper then place two thin slices over the blue cheese. 8. And two green pepper slices over the red ones. 9. Roll the chicken roulade from one end to form a cylinder, securing the seam with a couple of toothpicks. 11. Secure the ends as well. We definitely want to keep those flavorful juices inside. 12. Repeat the process for each of the two remaining chicken breasts. 13. Brush a baking pan with some olive oil and place the roulades inside, the seam side down. 14. In a small bowl, mix the olive oil with salt. 15. And brush the roulades with the oil mixture. 16. Place in the oven and bake (at 400 °F – 200 °C) for 30 minutes. There will be a little juice in the pan when your remove the roulades from the oven. Keep it please, it’s precious. 17. Remove the roulades from the pan and let them rest for 5 minutes before doing anything else. 18. Then remove the toothpicks and slice the roulades crosswise into 1/2 inch (1 1/2 cm) rounds. Then sit down for awhile and feast your eyes on that cute structure you’ve just created. When serving these cuties, pour a little of that precious and flavorful sauce from the pan over them. That will make them even more moist and delicious. 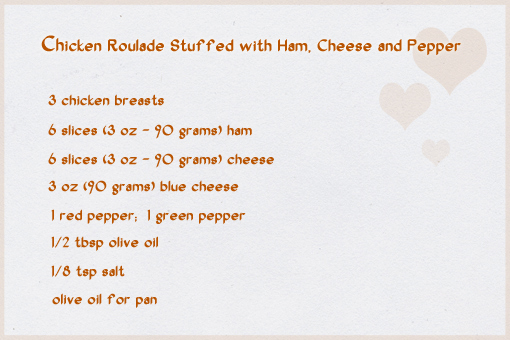 You can serve these roulades warm with toasts. Or, to create a more satisfying dish, serve them with mashed potatoes. Here’s another quick and simple recipe idea for you. It’s chicken breasts. Because I love chicken breasts. That’s the best kind of meat for me. These are coated in delicious mixture of bread crumbs, ground nuts, Parmesan cheese and parsley. They are then fried to irresistible perfection. But before that, these are the ingredients. 1. First, place the breasts between two layers of wax paper or plastic wrap. Then using a meat mallet or a rolling-pin (or anything that could do the job), pound the chicken breasts so that they’re evenly thin. They will spread out to at least 2 or 3 times their size as they flatten. 2. Slice each breast in half after flattening. That way you’ll achieve 4 nice portions. 3. Now salt the cutlets on both sides generously. This is the only time we are using salt while preparing this recipe, so there’s no need to hold back. 4. Now, let the dredging begin. First, dredge a piece in flour. 5. Then dip it in lightly beaten eggs. 6. And finally cover your cutlet with a mixture of bread crumbs, ground nuts, Parmesan and chopped parsley. I’ve used ground peanuts this time. But feel free to use any nuts you like and have on hand. 7. Set aside on a large platter (don’t overlap the pieces) and repeat with remaining chicken. 8. Pour the vegetable oil into a large skillet or pan and place over medium heat until a pinch of breading sizzles immediately when you drop it in the pan. 9. Place one breaded chicken cutlet into the hot oil and cook for about 4 minutes per side, turning once. Both sides should be golden brown and crisp, and the chicken should be cooked through. 10. Now, this is optional but your chicken can be served over a nice layer of warm tomato sauce. If you are into warm tomato sauce. I’ve served this delicacy with very simple cooked potatoes. But I can also imagine it paired with nice mashed potatoes or even fries. I’ve found a gorgeous recipe! I may also have found my favorite chef. The recipe took me into the world of delicious mushrooms which are cooked in a creamy thyme sauce. As if not head-spinning enough already, it’s all served over a fragrant and scrumptious garlic toast. 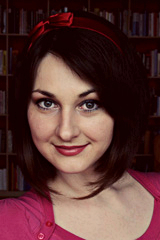 I really loved being in that world. The moment I saw the original recipe presented by John Mitzewich it became completely clear to me that I had to have that thing in my life. 1. To make your own mushroom ragout, first slice the mushrooms. I am using white button mushrooms (Champignons) for this recipe. 2. In a large, large (large!) pan, heat the olive oil over medium-high heat. If you want to go super yummy, you can use 1 tablespoon of melted butter instead of the oil. 3. Place the mushrooms in the pan – just pile them up, they will fit. 4. Then add the salt and pepper, stir and sauté the mushrooms until brown. Your mushrooms will cook down substantially. Okay, the next step involves wine. And this is what happens when I see wine around me. It seems that my hands start to tremble with joy. Or maybe it’s not joy. 5. When the mushrooms are nicely suatéed, slice the garlic, throw it in and sauté for about 30 second. 6. Add the wine and let cook for another 30 seconds. 7. Then pour in the chicken stock, cream and add the thyme. Stir and let cook for about 3 more minutes. Our ragout will slowly start to thicken up. Then taste and add more salt if needed. 8. And since it’s done now, remove the pan from heat. 9. Now we can get our garlic toasts ready. Just toast a slice of bread in the toaster and rub it with a clove of raw garlic. And you have a quick instant garlic toast. This is a very nice trick. 10. Finally, spoon the ragout over your freshly made garlic toast. This yummy treat can be also served in other delicious ways – with a salad or over a piece of chicken or steak.